If you’ve ever walked in a rainforest or even a greenhouse, you’ll know that the air inside is heavy with moisture. This phenomenon is caused by trees releasing water vapour through pores in their leaves called stomata. We also know that many big forests, and rainforests in particular, tend to get more rain than surrounding areas — hence the name. Although people have guessed that forests could help make rain, it’s always been a chicken-or-egg scenario: do forests make rain or do areas with high rainfall grow forests? An expanding body of evidence supports the idea that forests, in the right conditions, not only make rain locally but also hundreds of kilometres away. In Australia, we’ve cut down nearly 40 per cent of our forests in the past 200 years, leaving a fragmented landscape in their place. In Queensland, more than one million hectares have been cleared since 2012, and New South Wales and the Northern Territory have also recently increased logging. So if forests create rain, and we’ve chopped down almost half, have we affected the amount of rainfall we get? And is there any evidence that returning more land to forest could bring more rain? 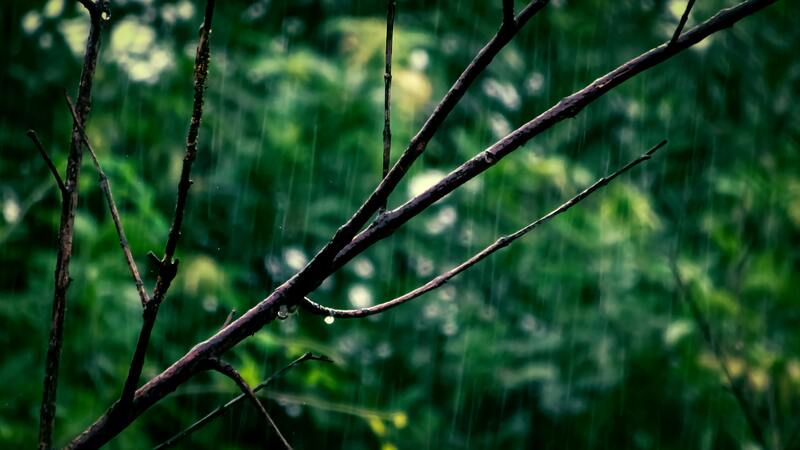 What’s the evidence that trees make rain? In the southern Amazon, the tree canopy turns a light shade of green as trees put out fresh shoots two to three months before the onset of the official wet season. Last year, researchers showed that the “greening” of the forest and increased atmospheric moisture were connected, and they used a hydrogen isotope to do it. Isotopes are two or more forms of the same element that have different numbers of neutrons in their nuclei, and therefore have different atomic mass. When water evaporates from the ocean, the heavier hydrogen isotope deuterium is usually left behind in favour of the lighter protium isotope. Water vapour produced by trees, on the other hand, has a much higher deuterium concentration. The researchers used NASA’s Aura satellite to analyse the level of deuterium present in the vapour above the Amazon during the early build up of rain. Later toward the wet season proper, the concentration of deuterium in the atmosphere above the forest reduced, as moisture was transported from the coast by increasing winds. The researchers suspect that early rain from the forest triggers atmospheric circulation that begins pulling in moist coastal air, which eventuates in even more rain. In other words, the moisture from the forest is kickstarting an early wet season. If we’ve been chopping down forest in Australia, have we affected our rainfall? The evidence for what is called “recycling of rainfall” in the Amazon has been proven beyond doubt, according to Andy Pitman from University of New South Wales. But that world-renowned rainforest is also massive. “There’s really strong evidence from isotopic analysis that on average, a molecule of water falls four to six times as it flows across the Amazon. No argument,” Professor Pitman said. “In the [Australian] tropics, there would be a similar process operating, but instead of a huge, great blob like the Amazon, you have a nice, thin pencil line of forests [along the coast]. “What happens is the air masses are coming in from the oceans, flowing across this pencil line, and the notion that that would generate enough moisture to make a significant impact on rainfall is pretty unlikely.”Although difficult to quantify, recycling of rainfall is likely to occur to some extent over Australia’s larger forests such as in the Blue Mountains, according to Professor Pitman. Around 50 per cent of native forests in the state’s south-west were cleared between the 1960s and 1980s, which coincided with a decrease of around 16 per cent in inland rainfall compared to coastal rain, according to University of Western Australia researcher Mark Andrich. “Around half of the rainfall decline, at least up until the year 2000, is a result of land clearing,” Dr Andrich told the ABC at the time. Historic clearing on the east coast has had a comparable impact, according to Clive McAlpine from the University of Queensland. “Especially in southeast Australia around the Murray-Darlin Basin area,” he said. “They certainly have an impact on temperature,” Professor Pitman said. Professor McAlpine’s research has also shown this. “Trees are a micro-climate, they cool the land surface. We’ve done a little bit of work with satellites which shows that temperatures are 2 to 3 degrees hotter in areas that have got no trees,” he said. So could regrowing forests influence drought? In regions dominated by tropical rainforest, research has shown that those forests can significantly influence broad-scale rain patterns. A 2012 paper in Nature found that air that had passed over large tropical forests produced around double the rainfall of air that hadn’t, and fell up to one thousand kilometres away. But in Australia, recycling of rainfall is more localised, according to Professor McAlpine’s research. “It’s not big weather systems, it’s the convective, local evapotranspiration and recycling of moisture back into the atmosphere from the vegetation that seems to have the strongest benefit,” he said. His team used models to predict the rainfall benefit that could result from regrowing Australia’s cleared forests. They experimented with keeping the “most profitable” agricultural lands cleared and returned “marginal land” to forest. And although Professor Pitman believes forest regeneration would provide minimal benefit to rainfall, there are plenty of other reasons why it’s a good idea. “It’s not a silver bullet, but it has to help, for several reasons,” he said. Original article published by the ABC, 15 September 2018.